It seems the pervasiveness of deplorable news sources in Google News is never ending. One that has appeared quite often for me of late is Parentherald.com. They consistently top the “News” for any celebrity gossip despite presenting as a site about “parenting”. Here is an amazing and recent story on Brad Pitt and Angelina Jolie that showed up at the top of my results…. I especially love that Jolie is suffering from “severed headaches” and “husband-and-wife bonding which is needed to keep the fire burning”. Hahaha! Can you just imagine what ParentHerald serves up as parenting advice? Obviously the writers have used some sort of translate software to translate the copy which means these writers are not in the US so why would they get top priority for info about US pop culture? By the way this is not an anomaly. It’s standard for all of their articles. Again. Why is this acceptable? Another interesting thing Parentherald does that other deplorable yet highly ranked Google sites like Christian Times do is aggressively promote Advertorials for IPads. Seems the quality of the content is irrelevant to Google. The question is why? Google continues to vehemently deny any wrong doing or any “pay for play”, but why are their still so many SEO sites that can “guarantee” you top placement with Google? Why does ParentHerald show up at the to of Google News consistently? Surely I am not the first to complain to them about this content. Google vehemently denies that organic search rank is rigged to favor the big players…as in the companies who are either paying Google via Adwords or can do favors for Google, but the evidence is pretty clear that the search game is in fact rigged to shut out the little guy. And as such is oppressing any real competition by keeping the same monied interests at the top of organic search rank —- which is exactly why anti-trust laws were created. But Google knows anti-trust laws will not be enforced against them since Google runs the FTC. Personally I am sick of Google lying about “organic” rank not being manipulated because it is so obvious. Not to mention Google has patents allowing advertiser info to connect to search rank! Why does Google encourage people to link their Google Analytics to their Google Adwords? In classic Google fashion when “asked” the question about whether or not paying Adwords helps your organic rank Google rigged the question using Google employees posing as Adwords publishers. “I have seen a drop in ranking for my site. Why can’t I get advice on optimizing my site for Googles search result through my Adwords point of contact”. Here is the screenshot from their video in case they try and edit it in the future which I think they have done with some of these incriminating videos. Problem is the person asking the question is Christoffel Hiltermann who works for Google in Webmaster Support and Education. The commentors are furious and call out Matt Cutts on lying about the fact that the “questions” are coming from random people when they are actually Google employees. “Pretty lame if you ask me. So does he answer any questions from real people? What a waste of time it must be submitting questions! There is a bigger story in this but I doubt anyone will bother. Why would Google do this? Because they want it to look like “Important Adwords customers” have actually seen a “drop” in their organic rank (aka no favoritism) AND that Google will provide no advice on organic search rank to even the biggest Adwords customers because they are dripping with integrity. Nothing to see here. Move along. And yes there sure is in “Ihar in Prague who works for Google”, not only for Google but he works for Google ranking! Check out Ihar’s resume from Linkedin. “I have every reason not to trust Matt. Regardless of what Matt Cutts says, our independent tests have shown a direct correlation between AdWords expenditure and Google organic search results positioning. Exactly, anyone with half a brain can see the biased-ness in Google’s search results. It’s amazing how fast these Venture companies skyrocket in page rank like going from 0 to 6 in a matter of months while the rest of us have been working our tails off for YEARS and our still below a PR of 4. This is key because you will often see the Google defenders claiming Google is a private business and can do whatever it wants. That is not true. Google’s actions are unarguably illegal because it is not clearly marking these results as “paid”. There are multiple lawsuits against Google accusing the company of not “acting in good faith”. I’d say that having Google employees pose as “Important Adwords customers” is the very definition of “bad faith”. Here are a few more comments from that video of Cutts denying Google is doing this and about Cutts lying about the Publisher asking it. “Christoffel Hiltermann work at “webmaster outreach” or Google’s Propaganda Ministry. So he asked Minister Cutts a setup question, where’s the harm? Notice the commenters figured out that Barry Schwartz is a shill for Google as a ton of these websites are which all claim this notion of Adwords being connected to organic rank is a crazy conspiracy theory. If you have a 66 billion dollar business model built on doing something very illegal how much of that money would you be willing to spend to have “bloggers” write articles about how Google is acting within the law? Millions and you would hire 1000s of “SEO experts” or at least what would appear to be 1000s of SEO experts to defend Google. Incidentally looks like Matt learned his lesson from this because he started only using first names shortly after the first incriminating video. But not before another question came from Webmaster “Warren Redlich” criminal defense attorney/Web developer (interesting combo) from Boca Raton. Interesting considering advertisers sued Google for putting their ads on shady parked domains JUST like this and $85 a day is a hell of a lot of revenue from Adsense for a site that only has one page and no content. Why was Redlich compensated so generously by Adsense? Thankfully a court recently ruled that the lawsuit can go through. So perhaps the plaintiffs should do a bit of research on the relationship between Redlich and Google. I found this great article in Seobook titled “the Rigged Search Game”. Yep, and Google plays the long game. They start out appearing legit for years to gain your trust and to accrue power and most importantly accrue a monopoly. Google insists there is plenty of competition, but it’s puzzling that no one can come up with an algorithm than can compete with Google. In the beginning I know that Bing was buying their search results from Google because I knew an insider (I don’t know if they still do, but they did a few years ago). So if Bing is buying their search results from Google how is that competition? Then you have the strange case of Yahoo. Yahoo’s CEO is Marissa Mayer a former executive from wait for it…..Google. Mayer was the Vice President of Google Product Search until the end of 2010. In 2012 she became CEO of Yahoo. How does that make sense considering the very elaborate NDA’s these Google execs sign? So is the rivalry between Yahoo and Google really just theater to convince us that Yahoo and Google are not the same? Exactly, the game is rigged to shut out the little guy. I have witnessed this first hand having a website that I have worked extremely hard on for years naively believing the meme that “content is king”. Yet every time we seemed to be doing really well and establishing credibility a new website would emerge and outrank us with our own content. Most recently Bustle and their demon child Romper. Incidentally Bustle was a wait for it…..Google Venture company. So this GV company which relies exclusively on how well it ranks with the search engines monopolized the top results for all things reality Television when they were very very late to join the game and had zero original content. Eventually the company was owned exclusively by Time Warner venture money but is it so crazy to suggest that the search engines have made agreements about how they will treat one anothers venture companies especially considering the millions that Time Warner gives Google for Adwords? And if you start looking at the Linkedin profiles of Google employees an interesting pattern emerges. The software engineers that control the algorithms flow back and forth from one giant like Google to another like Facebook to Yahoo etc, seamlessly. In fact Ihar from Prague now works for Facebook. So isn’t logical that these companies agree that if you are in this internet mafia you will ALWAYS get precedence over a small publisher, especially a small publisher that does not pay Google to advertise. See whenever a company is big enough to potentially pose a threat to Google, Google lets them in on the game and shares the profits. This ensures no one with any power will ever expose the game. Here is a funny article on SEO where the author Shaun Anderson is stating that if you want to be #1 for high traffic terms you will have to pay Google. And no one knows better than the SEO experts!! By the way Google recommends that you use their recommended “partners” to manage your Adwords accounts. (Again notice how Google outsources the gray area to their “partners” separate companies). Here it is in case Shaun changes it. Before you say he must have meant your ad would place at the top, Nope. Read this. He clearly means you will have to pay VIA Adwords to place #1 in organic rank which goes along perfectly with Google’s patent connecting advertiser “data” aka amount bid on search terms to organic rank. Hmmmmm, so if only Google could combine the two allowing people to place bids on terms and getting a bump in rank. I guess Shaun did not get the memo. You are not supposed to say that out loud. I’m sure all professional SEO folks know that you have to “pay” Google for top search rank, but you don’t blast that on your website. You tell your customer over the phone, not in writing. But it’s interesting that he is so nonchalant like this is just a fact that every SEO professional knows. The problem is things are only getting worse as Google “tweaks” their algorithm more and more to favor sites that are paying them. In fact I would even argue that sites paying Adwords millions of dollars are not really paying for ads, they are paying for organic search rank. And how would anyone be the wiser? This is how Google works their “magic” by obfuscating their criminal actions and creating layers of plausible deniability. Thus there is a glass ceiling of sorts ensuring that real small publishers will NEVER get to the top. They can at best be bought out by one of the oligarchs, but they will NEVER rise to the top no matter how hard they work and how quality their content is because this game is RIGGED! Additionally smaller Adwords customers will continue to get ripped off as Google will overcharge them to advertise on low quality sites owned by large Adwords customers or insiders. The big guys paying Google get overpaid, the little guys not paying Google get way under-compensated for their work and the power paradigm continues to shift in favor of the insiders. By the way if you look you will find countless claims by confused publishers who see their traffic and other stats fall off of a cliff the minute they either suspend an Adwords campaign or the minute they are overdue paying for an Adwords campaign. So how is that acting in “good faith”? The only reason I started noticing Bustle.com is because they kept showing up at the top of the organic search results out of nowhere a few years ago when they first started. I looked them up and saw that they were brand new. I was perplexed at why Google was giving this site with no track record whatsoever so much precedence over better more relevant search results. Then I saw that they were funded with a combination of Google Venture capital and Time Warner capital…so two search engines funding a D list celebrity tabloid site in the name of empowering women. Eventually Google dropped out, but only because they were angry that Goldberg got Time Warner involved behind their back. So now the primary money is from Time Warner and Facebook. Social Capital is a venture capital company owned by Chamath Palihapitiya from Facebook. Do you think this tiny women’s website may have some pull in terms of their search rank? After all the behemoths of Silicon Valley have been caught making agreements with one another on multiple occasions. In other words if you or I had the brilliant idea to start a website targeted at women’s issues do you think people would be throwing millions of dollars at us? Why would these companies invest in an idea that is far from original and actually completely saturated since theoretically if you start a website you have to prove yourself to Google and other search engines and work your way up which takes years—unless you have a way to control your search rank. If you have ever started a website you know no matter how great your content is you will be lucky to make $3 a day your first year and by year 4 or 5 you will be very lucky to make 5 figures a year. But hey in July of 2014 this brand new site crossed 11 million monthly unique visitors after hitting 10 million in June and as of October 2015 was on target to bring in over $10 million in revenue after their 2nd full year in operation. Bustle is now pulling in 31.6 million unique views a month. Again if you have ever started a website you know how absurd and impossible these figures are, particularly in light of the very low quality of their content. In fact in this BusinessInsider article in the comments section someone calls them out on lying about these statistics pointing readers to this site where you can see Bustle only has 10-15 million visitors a month with a 73% Bounce rate and only 1.05 seconds on the site and a very Slow load time: (2.478 Seconds), 73% of sites are faster. “Looks like they are buying shady traffic according to Similiar Web. 45mm uniques is great, but not if it’s all paid for…” the reader claims. I’m guessing this is why Bustle decided to disable any comments. They can’t have anyone calling them out on their lies publicly. And have you noticed the obscene political bias of the site? Their love for Hillary Clinton is cringeworthy. Im no fan of Donald Trump or Bernie Sanders, but the Hillary love from Bustle coupled with their pervasiveness atop any Google search result is disconcerting for sure. And yet strangely Romper appears to primarily cover D list tabloid reality show gossip just like its mom Bustle. Just what the world desperately needed–ANOTHER site to aggregate tabloid celebrity news. And the fact that the New Yorker has written an article gushing about this brilliant idea to start a website to aggregate news is also indicative of the inside connections the owners possess. Both reviews from writers complain that Bustle is obsessed with quotas and pumping out content with little regard to quality. My issue with these websites is not that they are horrible. Horrible websites will come and go constantly. My issue is how they are being subsidized and helped by serious inside connections. 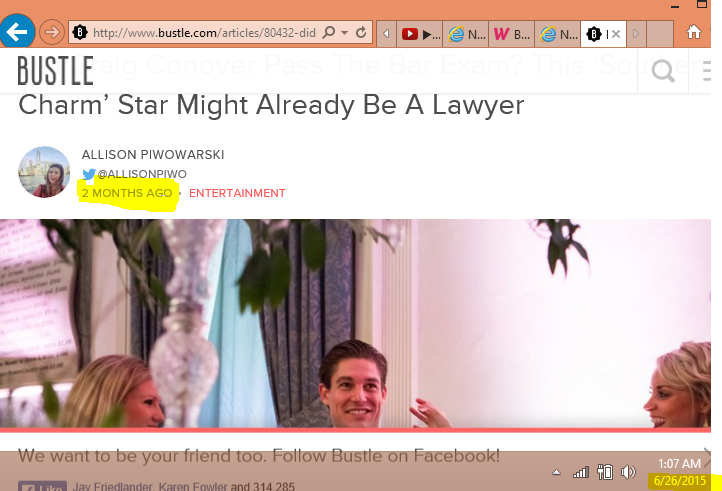 How did Bustle go from a PageRank of 0 to 6 in 2 years? — especially since Google claims they no longer change PageRank. (No they no longer change PageRank for sites without inside connections. That way the riff raf aka public can never really compete). Why are the content curators and internet providers allowed to also be content creators since they determine who lives and who dies in the website biz. And when will we hear more of an outcry from the public about these so-called “venture” companies rising to the top of the organic search results with such low quality content while the small publishers busting their tails to bring the public the valuable content they are actually searching for are pushed farther and farther down in the ranks? We already know from the leaked FTC documents that Google created a special algorithm to promote it’s own interests. These interests must include Venture Companies. The pattern I continue to notice again and again with sites like Bustle and The Inquisitr is that they were started by Venture Capital money by big very connected owners and investors, usually the search engines themselves all under the guise of some big social justice meme. Yet ALL end up just being tabloid content farms copying and pasting their content from other places. There are a lot of issues here and laws that are being broken with regard to disclosures and I hope the public will start raising some hell and demanding this VC insider shell game stop. If you still think Google is not using their God-like powers to help companies they invest in check out this story on Thumbtack–the site was caught buying spammy backlinks and penalized but the penalty was removed by their biggest investor, Google a mere 3 days later and yet spammy back links still pervade the site. I just showed several examples of Inquisitr committing content theft aka plagiarism and now we have word from an insider about exactly how rampant and widespread plagiarism at the Inquisitr is. This is interesting after the most recent hoax they propagated about a dinosaur birthday cake from Costco which allegedly depicted a dinosaur’s feet in the shape of number “666” on July 13th by John Albrecht. Costco allegedly pulled the dinosaur cake design from its online ordering platform. Problem is you can’t order birthday cakes online from Costco! And even better, the ‘customer’ at the center of the story was the Inquisitr reporter’s girlfriend. So the Inquisitr has gone in to MAJOR damage control talking about themselves as victims who were “duped”. Problem is this is not an anomaly. There are numerous claims of the site propagating hoaxes and reporters not doing even the most minimal due diligence to verify claims–and now reinforced by this claim by an ex employee that content theft was encouraged and was the norm. If the Inquisitr is this naive then they do not deserve to be called “news”. The question is why does Google give the Inquisitr such preferential treatment. There are countless claims of plagiarism against the site which viewers have reported and countless examples of circular linking schemes with sites like WetPaint and the Examiner, but Google refuses to take any action to remove them from Google News and remove them from the top of the SERPS. I suspect the truth is that Google and the other search engines in Silicon Valley are not only in the biz of content curation, but they are also in the BIG biz of content creation. After all since they control the supply and demand end of advertising their profits can not really grow unless they find new methods of guaranteed revenue and being the content creators allows them to keep 100% of the ad revenue. The Inquisitr was created by a writer at TechCrunch and TechCrunch is owned by AOL. Another prolific writer at TechCrunch was hired as a Partner at Google Ventures. Imagine that…look at the guys resume…not all that impressive in all. MG Siegler went from being a writer at TechCrunch to a partner at a multi-billion dollar investment company. Siegler is also CrunchBase so you can see how all of these websites have an agenda to prop up big G and I imagine big G returns the favor. By the way, if you examine each Google Venture company and there must be over a hundred by now you will see one mysterious commonality…they all have employees from “TechCruch” or “Crunchbase”. In other words there certainly appears to be a connection between The Inquisitr and Google. UPDATE 2/17/2016: Check out this ad for a post in The Inquisitr…$250 and notice how they brag about their PR of 6. This is highly unethical yet it seems that The Inquisitr can do no wrong in the eyes of Google. And this should prove it. If you have any info I highly recommend starting a blog and sharing it. The more these companies are exposed the more likely things will change. Google needs to stop playing favorites and bring transparency to this system. Put sites like The Inquisitr where they belong….at the bottom. I see I am not alone in observing a rapid disintegration in the quality of internet news and what Google deems acceptable for “news” and I see I am not alone in my frustration with the ethics of a website called The International Business Times. Keep in mind, this company is so big it owns Newsweek so the fact that they are stealing content with computer algorithms and the outranking the sites they steal from is infuriating. It would be one thing if Google acknowledged their behavior and kept them very low on the SERPS, but quite the contrary Google allows them to outrank the original source of the content. So I have been keeping a record of other incensed Publishers in the hopes that google will be publicly shamed into taking action and demoting this site in the SERPS. This complaint was filed 4 years ago but nothing has changed. “I am the owner of TheWeatherSpace.com, or The Weather Space … Which will be Science News Times in the near future, The Weather Space turning into the main weather section. The Weather Space is not all about weather, but “Space” as well … Weather and Space were the keys … however a couple writers wanted to write other science news so we granted this wish. I AM NOT ALONE: I know I am not alone where I say I know IBTimes is GAMING Google to death … Especially in the “Science Section” since they are suppose to be BUSINESS. Now: THE INVESTIGATION … Google .. .I will be updating this thread with proof that International Business Times is GAMING YOU. There are sites out there that do the right thing, post something and leave it there. I’ve seen sites take me on the rank before and did not feel the “NEED” to post the same article AGAIN 3-4 hours later. I’ve made a lot of revenue from being patient and the VALUE of my writers are simply to NOT REPUBLISH (Unless of course it is an update). One of the very guidelines of GOOGLE NEWS is simply to not republish articles. Now it may not seem like International Business Times (IBTimes) does this but they actually do. They use something called an article spinner. Article spinners take other’s work and you can make different synonyms an use a thesaurus to switch out words I suspected this and went ahead a researched IBTIMES. Some of their paragraphs do not make sense, which confirms they do not re-read the articles and they “SPIN THEM” from either their articles or other people’s. tv.ibtimes, au.ibtimes, ibtimes – etc etc … The list goes on. IBTimes is using different url extensions for the SAME STORIES and this is why they game Google News 24/7. They are consistently cheating the system and people who play fair are getting sick of it. I know I am. This guy is absolutely right. I have caught them spinning my articles on many occasions and like he says, the way the computer “spins” them they don’t quite make sense. Google claims “content is King” yet it condones computer written and stolen content. The Publisher is also right that IBT is allegedly about “business”, yet they have succeeded in monopolizing every niche even D-list celebrity gossip. Niche sites should get priority over a website that covers EVERYTHING especially a site that claims to focus on business. It should be obvious to Google that when sites like this start branching out to Science and Entertainment news they are doing it purely for clicks and not because they have a special interest or expertise in the field. If you are a legit Publisher demand Google address sites like IBT and stop rewarding them for stealing our work. Again my question is when will Google’s words match their actions. I started noticing several websites changing dates to manipulate their SERP rankings. Sometimes they would make the date more current so the article shows up as a recent news story and sometimes they would back date so it looks like the website was first to publish something. Sometimes they would do both. Either way these sites were violating Google’s guidelines and not being penalized. In fact in some cases listed below you can see a site has their two duplicate stories at the top of the cue. Here is the infamous Wetpaint. I couldn’t figure out why the same article “meet the contestants” by Wetpaint… kept showing up in my Google News alerts. I noticed the date change countless time but was only to screenshot 3 of those changes. You can see 4/20/2015, 4/22/2015, and 3/16/2015 are the EXACT SAME article and finally 3/11/2015 is slightly different but contains the exact same information reworded. None are the original publish date. You can see on the bottom example all they do is change the title a tiny bit from “meet the guys” to “meet the lucky guys”. Both try and coerce you to “click through their gallery”–same gallery. The March 16th date is a lot earlier than that article was published. Look…. the date of all the photos isn’t until 4/2015. How can the photos have a later publishing date than the actual article? Because Wetpaint is changing the dates of their articles. Notice they created one that would be really early even before the official spoilers were released so they look like they are first, then one that they change to keep current so it always shows up in recent news. So their strategy is to have at least two duplicate articles. One to be first, one that they can continuously change to keep in news. Here is another one of my favorite Wetpaint changes. The article name is “Who is Eliminated contestant Carly Waddell?”. 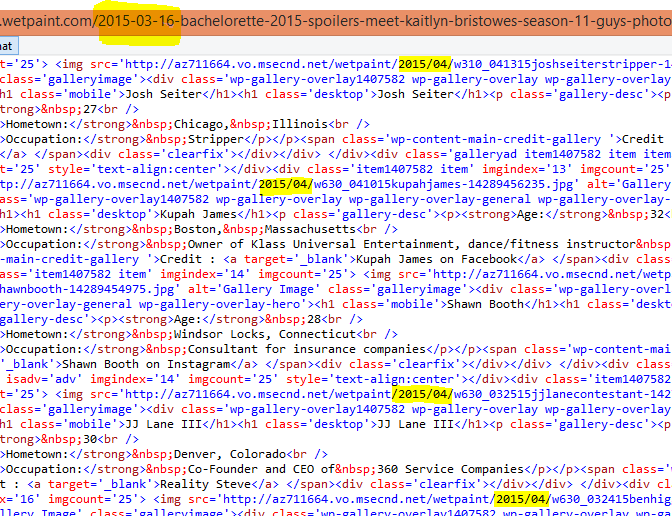 The article is dated January 15th, 2015, 1 week after the show premiered. Carly did not get eliminated until week 7. Wetpaint needs to be more careful when they backdate so they don’t back date a story so far back that it is before it even happened! You may argue they changed the text a tiny bit, but it’s the same information–even the exact same title. Here is another one from Bustle.com. You can see its from 13 hrs ago screenshotted May 4th. EXACT same article below dated April 16th. You can also see it’s being reissued as “news” on May 4th. You can see each of these examples are “news” sites. Bustle kept changing the date of this article up until early May. BTW Bustle.com is a Google Venture project. They received $100,000 in seed money from Google. The rest of their $6.5 million in seed money came from telecomm giant Time Warner so are these “start-ups” getting special treatment since big tech owns a stake? 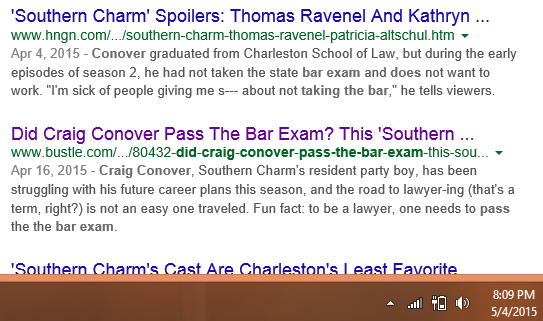 As a side note, one of my favorite parts about this news story is where the writer claims she doesn’t know whether Craig passed the BAR or even took it! Talk about click bait! Here is an instance where the same site, The Inquisitr changes a few words but writes the same article and both articles are at the very top of the cue. Is this seriously acceptable for a “news” site? This is clearly manipulation designed to deceive the user. And none of these are small sites. Wetpaint recently sold for $30 million dollars and has been getting away with this sort of behavior for years. UPDATE 1/2016: The parent company of Wetpaint aka Viggle recently filed for bankruptcy after taking millions from investors. I suggest the investors and their attorneys look at Google for artificially inflating the value of Viggle–keeping Wetpaint at the top os SERPS despite black hat techniques. Also look at the connection between Adwords PPC campaigns and how they ranked for search terms. If there is a connection (and I strongly suspect there is) that would show that Google conspired to artificially inflate the value of the company. The other sites are very highly ranked despite this behavior in addition to other manipulative tactics. The Inquisitr has been caught plagiarizing content and printing hoaxes—not to mention their painfully slow page load time…over 4 seconds! Slower than 93% of other sites yet The Inquisitr tops the cue every time multiple time with duplicate content. So does Heavy.com and Bustle.com. These sites are making millions of dollars off of this coercive and deceptive behavior. How much longer will Google look the other way? I have started putting a list together of very spammy sites that do not belong in Google news. If you have any to add let me know.